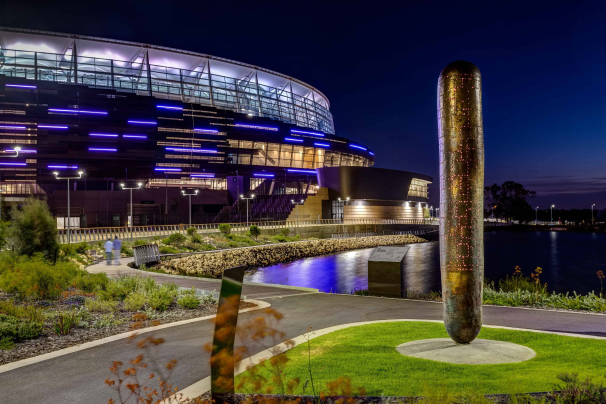 Waanginy Boorna — Message Stick, a richly symbolic sculpture for the recently opened Optus Stadium in Perth, Western Australia. 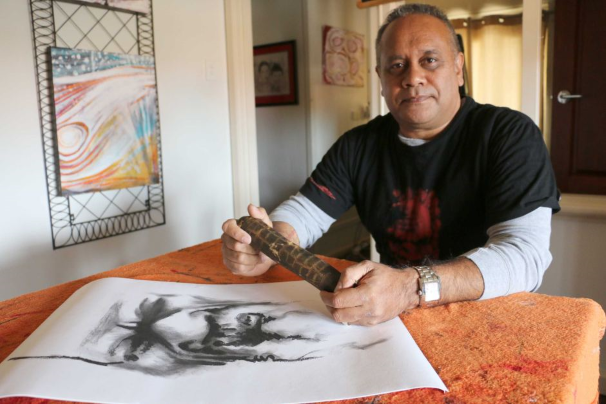 Barry McGuire is a Balladong, Yued, Wadjuk, Pinjarred Noongar who is highly regarded as a visual and performing artist, leader and mentor in his community. In this work, the artist has up-scaled the form of the message stick traditionally used to invite nations together. Standing at 4.2metres tall and fabricated in cast bronze with patina finish, the sculpture’s tactile surface texture is directly influenced by the original artefact. Illuminated by internal lighting at night, the work creates a sense of warmth, ceremony and welcome. The resulting work is a meaningful iconic totem for the new stadium, inviting all nations together to celebrate whilst honouring the significance of the Wadjuk nation and its living culture.